‘Shaman Stones’ came to be as the direct result of a dream. It’s not the first time sacred tools have been gifted to Taz during the dreamtime, but the detail and insistence of spirit certainly was a first. Here, she explains what they are, how they work and why they needed to be shared. It was one of those ‘toss and turn’ nights and I finally met the dreamweavers after some deep meditation. I’m not sure how long I’d actually been sleeping, but the symbols seemed to begin flooding before my ‘dream eyes’ the second I found unconsciousness. Symbol after symbol, followed by explanations and instructions, flooded into my dreams. As the last symbol swam through my mind, I partially woke up. I was tired. I had an early start the next morning. I didn’t want to get out of bed, so I closed my eyes again and tried to go back to sleep. I heard one of my guides telling me to get up but, in my sleepy state, I chose to ignore him; seconds later, I ‘felt’ a presence in the room, followed by a very physical poke, just below my nose. It wasn’t painful or foreboding but, quite simply, a very firm instruction to haul myself out of bed and note down the dream symbols before my conscious mind decided to discard the dream. In the days that followed, I began to quest for the right stones. By the end of the third day, I’d made a prototype set of ‘Shaman Stones’ (the name chosen by spirit, not me!) and begun to use them. Within a week, I’d sourced lots more stones, as well as wood, bone and other materials, to make more sets. Mostly, I created sets from stone, as I was guided to do! Remember, the stone people are older than you and I and each carries its own energy and teachings. Usually, if I'm given instructions to create something through the dreamtime, it tends to be for my personal use or, sometimes, to help a specific individual or place. This time, the message was quite different. Shaman Stones need to be shared with the people - I was told that many two leggeds had lost their connection with Mother Earth, living their lives with little or no awareness of the energies around them and with a serious lack of direction outside of ego-driven materialism. This is where Shaman Stones can help. 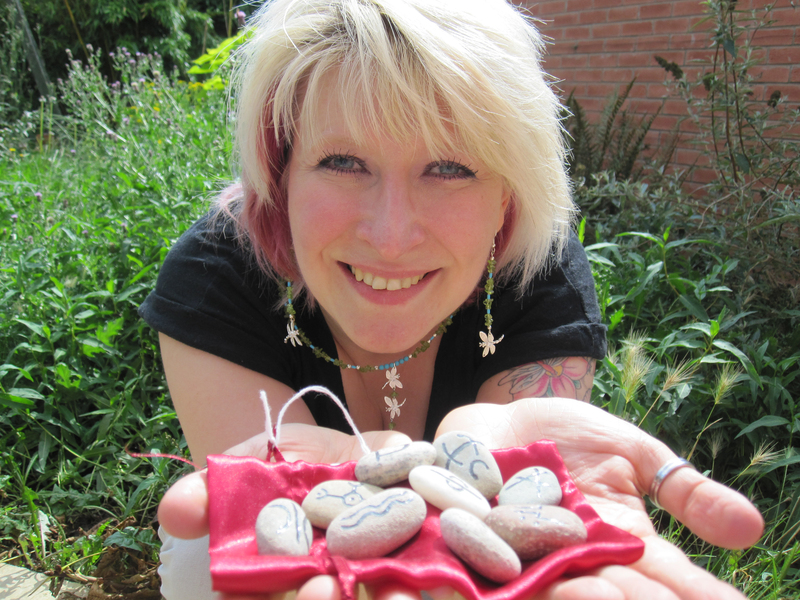 Not only are the stones great for those on a spiritual path who feel drawn to use them, but they can help others begin to connect and open their 'spirit eyes' and hearts. The stones carry ancient wisdom; they come from the earth and so help us to reconnect to the lands we walk upon each day. Each of the stones carries its own symbol and teaching, but none of them will tell us exactly how to go about our lives; the symbols offer guidance and lead us gently to our soul's path without dictating or providing an escape route from tapping into our own heart minds and higher selves. They teach us to listen to the silent voice within, to tune into the energies around us and to build awareness of All Our Relations. The Shaman Stones can't change the world alone, but they can lead us towards a a more balanced path, help us to discover who we really are and enhance our awareness of our individual roles on the planet and the ripples we may create. As with most guidance / divination / oracle sets, it’s best to let intuition be your guide (although the sets do come complete with a guidance sheet/oracle guide book) - tune into the stones, using the instructions as a guide if need be, and follow the advice that pops into your head. There are three main ways to use the ‘Shaman Stones’, using one, two or three stones from the set. For any reading, hold the pouch loosely in your hands and concentrate on the situation you’d like guidance with. Be aware that the stones will not give ‘yes’ or ‘no’ answers - their role is to guide you in terms of your actions, the direction to take and the energies around you at the time. A one stone reading simply allows you to draw a single stone and tune into its meaning. Two stones provide an overview of what’s just behind you and what’s yet to come. Three stone readings provide a picture of past, present and future. In any reading, the dreamstone trumps others you may have drawn, in that it speaks of the importance of meditating and dreaming with the symbols you’ve pulled. Of course, you may choose to dream with any of the ‘Shaman Stones’, but the dreamstone suggests this is necessity, rather than choice. Treat your ‘Shaman Stones’ with respect - never handle them roughly or with anger and remember to cleanse them regularly, either by ‘charging’ them with sunlight/moonlight or smudging them with sacred smoke. Oh, and talk to them…they like that! Good luck. Do visit our Facebook page and share your ‘Shaman Stones’ adventures. You can also view a little video about the stones here.